The sunny Caribbean is calling as the winter weather freezes up north. With the New Year just around the corner, now is the perfect time to plan a villa vacation in the Caribbean. Make your New Year’s resolutions for 2011 to relax, spend more time with family, and simply enjoy all the pleasures of life. Vacation on the island of St. Thomas and take in fantastic ocean views, play golf at the world-famous Mahogany Run Golf Course, enjoy long meals filled with lingering laughter, and explore the wonder of an island filled with pirate tales and ship wrecks. Stay at Villa Banana and bask in all the amazing amenities St Thomas has to offer. This five-bedroom St. Thomas villa is wonderful for a Caribbean family vacation. 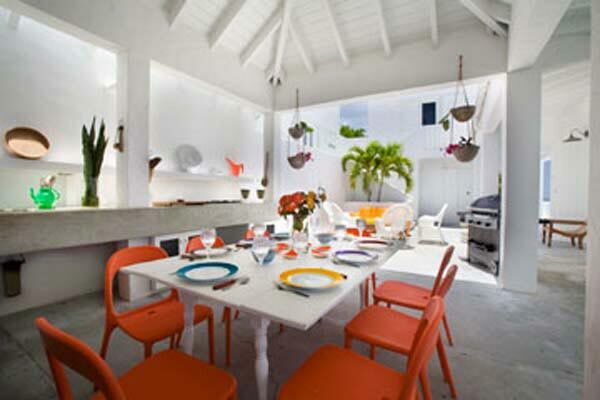 Modern and minimalist, bright colors pop against pristine white, adding fun flair to this stylish home. Banana trees line the road leading to the appropriately named Villa Banana, welcoming you to your home away from home. Perched on the very edge of a cliff, Villa Banana offers amazing vistas of the ocean and dramatic views of the surf below. Open and airy, the six-pavilions making up Villa Banana allow cool breezes to float through, sweeping away the heat of the sunny Caribbean day. Villa Banana is just a five minute drive from the world-renowned Magen’s Bay Beach, so you can spend sun-filled days listening to the lap of waves as they caress the shoreline while lounging in the powder-soft sand. For days when you simply don’t want to make the short drive, lounge by the pool that sits so close to the edge of the cliff it feels as if you’re suspended just above the surf. Take the family for a trip everyone will enjoy, and discover Villa Banana on St. Thomas.